After years of devastating funding cuts, California schools begin to get much needed relief. Last week, in the wake of the passage of Prop 30 and Governor Jerry Brown’s proposed budget, the bond rating agency Standard and Poor’s upgraded the State of California’s credit rating from “A-“ to “A.” Yes, this is the same credit rating agency that is being sued by the federal government for its role in causing the Great Recession, but they’re still one of the only games in town, so we still pay attention. (And oh-by-the-way, California State Attorney General Kamala Harris is now suing S&P too.) Regardless, the upgrade moved California up a notch from the worst credit rating in the country to second worst, behind the new last place finisher, Illinois. Yesterday, the perhaps more credible Moody’s announced that it was impressed with the steps that California has taken to right its financial ship in the wake of the Great Recession, but wasn’t quite ready to boost the state’s credit rating yet. The state’s “improving economy, combined with recent tax increases and spending controls, has put the state on a path to large surpluses, although one that is typical of the boom-and-bust revenue and economic cycles of California,” said Emily Raines, the ratings agency’s VP and Senior Credit Officer. In other words, we’re on the right track, but the finish line is still quite a way off. Personally, I can live with that…….for now. This newfound budget security was made possible because last November, in what must have come as a complete shock to Republicans, California voters approved a plan—Prop 30—to raise taxes slightly on the wealthiest Californians in addition to temporarily raising the state sales tax, effectively spreading the pain to all Californians. This was a slap in the face to Republican orthodoxy, since the only acceptable thing to do with taxes is to cut them, if not eliminate them altogether. When Gov. 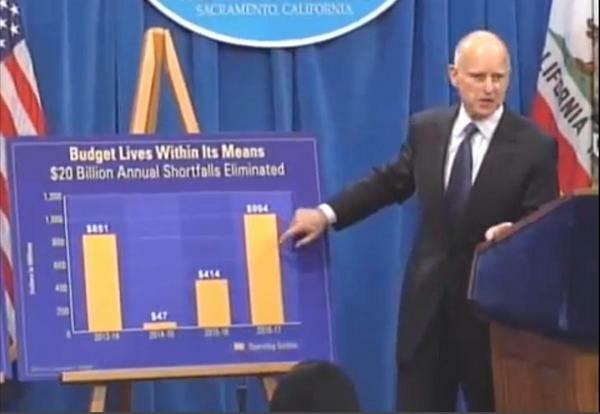 Brown released his budget proposal last month, the state’s legislative analyst concluded that California would still run a deficit of $1.9 billion for FY 2013 instead of the $25 billion of just a couple of years ago, but that if things continued on the same trajectory the state could be running significant budget surpluses in the following five years. In fact, the LAO credited the governor and the Legislature for its “budgetary restraint,” but that without Props 30 and 39, the state would still be running significant structural deficits. And under the governor’s plan, the state’s current $28 billion debt will be whittled down to $5 billion by 2016-17 according to the California Budget Project. Even so, there are still significant problems ahead with regard to unfunded liabilities in the teachers and state employee retirement systems. But hell, Europe wasn’t rebuilt in a day, and the California economy won’t be either. This has got to be absolutely killing Republicans, though. The use of a combination of spending cuts and tax increases to eliminate the budget deficit and pay down the debt? They should be ecstatic, but then again, Republican dogma was never about reducing deficits or debt, it was about drowning government in a bathtub. The point is this: Austerity measures by themselves do more harm than help in the long run. Yes, the slash and burn approach served to stabilize the budget in the short term, but there comes a point where you cut so much out of a budget that you start to do real damage to real people’s lives. Not the uber wealthy, but real people. Middle class people. Kid people, since nowhere were the austerity measures instituted since 2008 felt more deeply than in California’s schools, which were in big trouble even before the Great Recession. According to the California Budget Project, the state cut school funding 15.3% between 2007 and 2010 as a result of massive budget shortfalls. California ranks 46th in the number of students per administrator. California ranks 47th in K-12 spending as a percentage of personal income at 3.27%, while the national average is 4.29%. California ranks dead last in the number of K-12 students per teacher at 20.5. It’s worse in the San Diego Unified School District. California ranks dead last in the number of K-12 students per librarian (s/o to Anna Daniels) with a whopping 5,489 compared to a national average of 830. More austerity wasn’t going to fix that. It would only make it worse. Much worse. And while Prop 30 isn’t a panacea that’s going to magically fix everything, it’s a massive step in the right direction toward restoring what was once the most envied school system in the entire country, if not the world. Blaming teachers wasn’t going to solve anything, either. Teachers aren’t the problem…..well, technically they are, as in there aren’t enough of them because school districts have been forced to lay off huge chunks of their staffs—teaching and otherwise—just to keep their schools open. The state had already deferred $7.4 billion in funding in 2011 in addition to the $7 billion in previous cuts, making a dire budgetary situation even worse. In San Diego, teachers already agreed last year to a reduction in the number of instruction days from 179 to 175 in order to stave off the termination of 1,372 teachers, which would have increased the average class size in the San Diego Unified School District from 24 to 31. Fewer days worked also meant less pay for teachers, a sacrifice they made for the good of their students. California schools are just the most prominent example of what happens when austerity is the sole focus of lawmakers in search of ways to close budget craters. It’s very easy to say that “we have a spending problem,” and that massive spending cuts need to be made. The problem is in sticking to that meme after massive cuts have already been enacted. When challenged, austerity advocates are typically unable to define specific programs or expenditures that need to be eliminated. They just know that it has to be done as an abstract notion. Which is why I’m so proud of California voters—although voters should never have been required to do the Legislature’s job for them, but that’s another issue altogether….one that has been resolved—at least temporarily—with supermajorities of Democrats in both the Assembly and the State Senate. Apparently Californians are a much more self aware lot than they’ve been given credit for. They recognized that while budget cuts were necessary, by themselves they would not solve our problems. They were also smart enough to recognize that massive cuts to our schools were among the biggest threats to our long term fiscal viability, and that any legitimate solution to the budget crisis would necessarily have to involve some form of revenue increases. It is usually assumed that when presented with the option to raise taxes, voters will summarily reject the idea. But not here. Not in this state, where education has once again been made a priority. California is by no means out of the woods yet. There’s still a lot that could go wrong, particularly if Congress allows the sequestration cuts to happen as scheduled. But after years of belt tightening things are looking up in the Golden State, and they’ll stay that way as long as state lawmakers continue to act responsibly. What will be interesting to see, in light of Texas Governor Rick Perry’s swipe at California, is how the California economy grows in the next few years, particularly in comparison to Perry’s Texas. I’m guessing that savvy business leaders will see the long term affects of Texas’ austerity-only methodology as detrimental to their business interests, particularly when it comes to their approach to schools and higher education. Which state will truly prove to be a role model for growth? I’ll put my money on California coming out the victor. Good article, Andy. You have really hit several “nails on the head”. The one thing that has bothered me – not about your article but about a fact – that cutting back the school days is hurting only one group of people – the students. Sure, it is cutting back on monies spent for salaries, upkeep, etc. but the product that we, the teachers, are dealing with, cannot be “recalled” to put in a missing part in later years. It’s ok for the auto industry to say that they forgot a bolt to keep the axle attached to the car, but we don’t have the luxury of doing that. We have one time to do it right, and only one time. The students continue to get a short shrift and it would be nice if someone would realize that. School is ending earlier in the day at some schools; there are many “teacher in-service days” that are taking away from instruction, etc. We’re falling behind our competitors, and it is going to get worse before it gets better. California is again leading the rest of the nation not only on education but also on climate change. As of January 1 California is the first state to put in place a cap-and-trade program for carbon emissions. I’m starting to be proud of my state again. John See below, we rank in the bottom 10 of all states nationally in academic achievement. What the heck is there to be proud of? You can buy into the Govvies plan, but there is nothing fixed in this state. Andy, While elements of what you say is true, the missing element of your thesis is the revenue projection. What happens when the folks we are taxing leave Ca? Next May when we are looking at revenue, what might we see? less than projected. Additionally, the reason austerity works is that we find out what is really important. How can austerity in schools work when we are spending millions on Medical marijuana programs? Priorities. Here’s the facts, our schools rank last nationally and have for about 15 years. Our teachers are among the four highest paid in all 50 states, and our achievement for kids is in the bottom 10. Money doesn’t fix education, teachers committed to making it happen does. Smaller class sizes works. But more money in the state coffers? And to boot The Govs plan has brought NO (AS IN ZERO) New money to schools. He has simply replaced what he threatened to take away. We’re still looking at cutting in order to make things work. You have drunk the koolaid my friend, and be careful its not something undrinkable. Oh yes, “the sky is falling’. And everybody who creates jobs is going to leave California because of higher taxes. Ain’t gonna happen. Chris, I would like to see a link that proves CA teachers are the highest paid. That is highly doubtful, but they do deserve a good salary despite what Conservatives think of teachers and public education. They deserve to be well paid for their long earned qualifications: The requisite Bachelor’s Degree, the extra year of school and six months of student teaching to obtain a teaching credential, and in many cases a Master’s Degree or better. In any other industry workers with those credentials would be paid accordingly. Teaching should be no different. And of course Prop 30 hasn’t provided much funding to CA schools……yet. The money has only barely started trickling in. The budget at this point is merely a projection of revenues that they EXPECT to come in as a result of Prop 30. But they have budgeted a restoration of some funds to our school systems, and in SDUSD, because of the passage of Prop 30, they were able to maintain their current staffing level instead of issuing the dreaded annual pink slips. They may even be able to add teachers to the rolls this year. As for people “leaving California,” show me the numbers that prove this mass exodus. It’s not happening, anymore than Conservative assertions that businesses are fleeing California for Texas en masse. It’s a paranoid fantasy……something that I’m sure Conservatives would be thrilled about, even those in California. But let’s assume that it did. Wouldn’t matter, since school funding is based on the number of kids in each school. If families are leaving CA, they’re presumably taking their kids with them, which means that CA no longer has to fund their education. California places third in terms of gross dollars for teachers salary, below Connecticut & Massachusetts; comparing teacher pay to cost of living California places 14th. 254 businesses left California in 2011; California entrepreneurs started 167,000 businesses the same year, according to CNN/Money. California is home to the largest number of Fortune 500 headquarters of any state. Mr. Chris, I don’t see you offering any ideas on how to fix public education. Could it be, Mr. Chris, you want all schools to be private? Would that make it better for you? Thank you for the corrective numbers. This article by Andy is good news, but I hadn’t expected anything else once the people passed the tax increase and put Downtown Jerry Brown at the helm. I have been very proud of our citizenry, to see through decades of selfish propaganda in regard to taxes, and I look forward to more progress to come. I have always loved that one about businesses fleeing.